After serving as a professor for 18 years within the School of Media and Public Affairs, Albert May, who sought to revitalize the school's curriculum, is retiring. 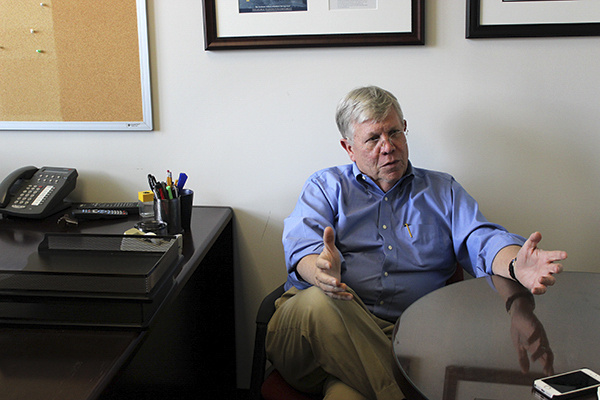 After an 18-year stint at GW, a professor at the School of Media and Public Affairs is retiring to start what he called the third chapter of his life: retirement. Albert May, 66, who has been involved in refreshing SMPA’s journalism curriculum while teaching news writing and campaign reporting courses in the school, packed up the last of his items in his office last week to round out nearly two decades at the school after a 23-year career in print journalism. He started at GW by stepping into what was supposed to be a one-year visitor teaching position in 1997. The then-director of the school, Jean Folkerts, hired him permanently, and put him in charge of the journalism program in 1998. He ran the program for eight years and temporarily stood in as acting director of the school after Folkerts left in 2001 before returning to teaching. But he knew he wanted to teach ever since he had worked as a teaching assistant while getting his first master’s degree in political science at the University of Missouri at Columbia in 1973. He also got his undergraduate history degree in 1970 and a master’s in journalism in 1974 from the same school. “That had whet my taste for teaching, and I always wanted to try it,” he said. And since he’s joined the ranks at SMPA, there have been a number of changes in the program, like its move into a new building. The school moved into its current location at H and 21st streets in 2001, just months before the September 11 terrorist attacks. May said he distinctly remembers what it was like to be teaching on that day. Professors had to send their students back to their residence halls, but he had no way to evacuate because the city was in gridlock, he said. While the students were promptly sent to their residence halls, he and his wife, who had been working at the University at the time, walked to McLean, Va. to evacuate the city. “I’ll never forget walking up, thousands and thousands of people walking up through Georgetown, across the Key Bridge, and you could just see this huge plume of smoke coming out of the Pentagon,” May said. Before coming to GW, May held several reporting jobs for publications in North Carolina, Georgia and Arkansas. He started his career working for what is now called the Arkansas Democrat-Gazette as a reporter, where he covered mainly government politics. He moved on to work for News and Observer in Raleigh, N.C., where he was the Washington correspondent and the chief Capitol correspondent, before he shifted into an editor position at the Atlanta Journal-Constitution. He held that post for four years before moving up to D.C. to take the job at GW. During his 23-year reporting career, he covered three state legislatures and three national campaigns. In 1987, May received one of 12 Nieman fellowships to Harvard University, one of the most prestigious journalism fellowships in the country. He received GW’s Morton A. Bender Teaching Award in 2001, and the SMPA Robert and Christine Staub Faculty Excellence Award in 2013. While teaching, he stayed involved with the inner workings of the school, helping to revamp the journalism program’s curriculum to keep it competitive with other schools, he said. May said the school needs to keep up with the “changing media environment.” He said SMPA, and journalism schools in general, need to strike a balance between teaching students about the new technologies in media but staying true to the “core values and norms of journalism,” like critical thinking, strong writing and ethics. Frank Sesno, the director of SMPA, called May “a reporter’s reporter” who has inspired years of journalism students. Sesno added that May’s reporting skills have propelled him to years of success. May said it’s time for him to retire so that he can start the third part of his life. After two careers in both print journalism and higher education, he’s gearing up to take more time off. He said he plans on continuing research in future years and even teaching at GW some time again if the opportunity arises.